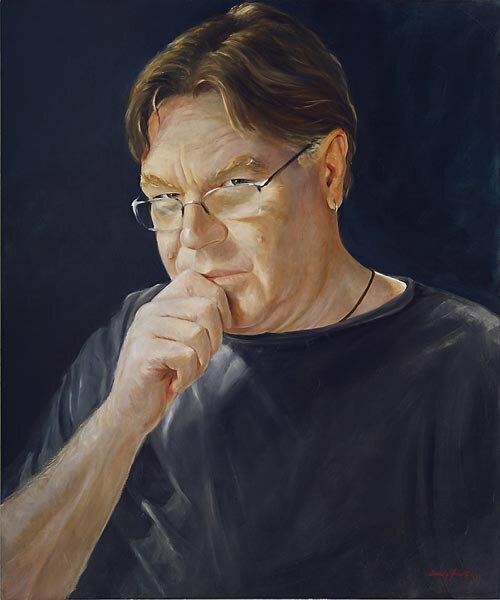 Bryan Dawe, the subject of Anna Minardo’s portrait The question, is one of Australia’s leading political satirists. His long-running political interview segment with John Clarke screens each week on ABC-TV’s The 7.30 Report. He was also in the popular ABC series The Games. Dawe has worked in theatre and radio and appeared in the Australian films The Castle and The Honourable Wally Norman. Born in Rome, Minardo graduated from the Academy of Fine Arts, Rome in 1968. She came to Australia in 1980 and maintains studios here and in Italy. She has had over 50 solo exhibitions and been commissioned to create many public works and paint many portraits including one of Pope John Paul II in 1999, which was held in his collection. Her work has been collected by Lady Primrose Potter and Vittorio Sgarbi among others. Minardo won the International Specialists Skills Fellowship in 1993. Her art prizes include the International Stone Sculpture Award, Sardinia in 1996. This is her first time as a finalist in the Archibald Prize.